Jasmine Barber – Sno Away (rolling snow shovel that avoids back strain) – Recognized Inventor Award and Connecticut Science and Engineering Fair Award. Shiven Patel – Stop, Drop, and Spot (beacon to help find fire extinguisher in smokey room) – Recognized Inventor Award and Connecticut Academy of Science and Engineering Award. Alek Jorge – Smart Helm (fireman’s helmet with sensors and transmitter to alert incident commander if fireman is hurt or down) – Recognized Inventor Award, Connecticut Fire Marshals Fire Safety Award, and Angel Investors Forum/Connecticut Venture Group Young Entrepreneur Award (this award connects Alek with potential investors in his invention). Olivia Mullings – Temp Safe (alarm system if baby or pet is left in hot car) – Frank J. Link Family Award for Innovation in Technology Award, Boehringer Ingelheim Cares Foundation Life Sciences Award, United Technologies Corporation Moving the World Forward Award, and the McCormick, Paulding, and Huber Patent Award (this award was given last and highlighted as the top award which provides about $10,000 in legal services for a patent search and application). 17,000 students across Connecticut competed in local CIC competitions this year — we had 56 competitors at our local event in March (50 students from the Academy of Aerospace and Engineering, and 6 from the STEM clubs in JWMS and MKMS) – so we made up about 0.3% of all Connecticut competitors. The top 15% of inventors from the local competitions competed in one of five regional competitions this year — we had 9 competitors go the Central Regional CIC in early April (four 8th graders and four 7th graders from the Academy of Aerospace and Engineering, and one student from JWMS STEM club). Volunteers from GKN Aerospace and PCX Aerostructures judged the inventors and picked the winners who advanced to regionals from our local CIC. The top 40% of inventors from the regional events, 660 students total from 87 Connecticut school districts, went to the state CIC — we had 7 competitors (all four 8th graders, and three of the four 7th graders from the regional event) – so we advanced at more than double the average rate (100% of 8th graders advanced, and 75% of 7th graders advanced) and we made up about 1% of the competitors at the state event. There were about 300 total awards given at the state CIC, so about one award for every two students – so it would have been reasonable for us to get about three awards, yet we got eleven awards, far above the average, including the top Angel Investor Award and the Patent Award. 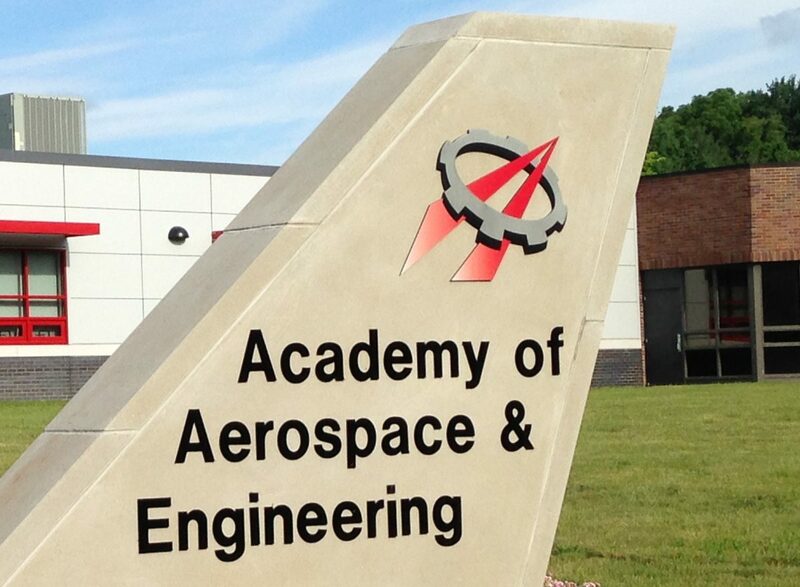 I give all these statistics to show that today’s CIC results validated the Academy of Aerospace and Engineering as a strong STEM program where students are learning the concepts and skills sought by universities and industry. I recommend this program highly to any elementary or middle school STEM teacher for your students. All four students will also be competing in the National Invention Convention and Entrepreneurship Expo on June 1-3, 2017 in Alexandria, Virginia. The 8th graders at the Academy of Aerospace and Engineering have been working on STEM (science, technology, engineering, math) project to design and build a prototype for a monumental sundial that we can display outside our facility. Each crew (student group of 4 to 5 students) is working on its own design, then all the crews will pitch their ideas to the administration. The winning design will be built outside as a class gift, once approved by school authorities. Sundials can be made in many forms. The more accurate and all encompassing the design, the more complex the sundial becomes. Students have been researching and brainstorming ideas, and they have had many questions. To help them visualize how a sundial works, Ms. Garavel led the class in a project to build a simple, handheld paper sundial that we took outside and tested. First the students tried using the sundial horizontally, the way it is intended to be used. Then I challenged the students to put it on a vertical wall to see if the design could be altered to work there–and not just one vertical wall, but one facing south and one facing east. The students took up the challenge and quickly came up with logical changes that would make the sundial work in each situation. Afterwards, we discussed this exercise as a class. The students understood how using a simple model like this could help in the early stage of any complex engineering project to give the designer a clear idea how something worked. They connected this exercise with something we had done earlier in the year when we copied the process the Wright Brothers had used by making simple airfoils that we tested in a wind tunnel before we made a more complex electric motor powered model airplane. We even discussed how this process could be useful outside of engineering, such as in a business that tests a product in a small focus group before committing a large amount of resources to produce it. 8th grade students at the Academy of Aerospace and Engineering have been studying astronomy, especially the Solar System, over the past month. This is the focus of the Earth Science unit in the 8th Grade Science curriculum. The main ideas that students have been learning involve the motions of the Earth and Moon in relation to each other and the Sun. Topics include the Moon’s phases, the Earth’s seasons, solar and lunar eclipses, and oceanic tides on Earth. I have taught these topics in the past, and while I found them relatively simple as a teacher, I learned that most students find them confusing and difficult to learn. Ms. Garavel and I decided to plan the unit differently this time–instead of presenting the topics in text or visual demonstrations, we used an inquiry approach from the start. To begin with, I had the students start two one-month lab experiments: one was to observe the Sun for sunspots each day to see if the Sun showed rotation, and the other lab was to observe the Moon each day to see how its phases and position in the sky changed. The Moon observation lab was also interesting, as I learned at the beginning that most students had little idea how the Moon moved through the sky or progressed through its phases. By the end of the lab, the students had seen a complete lunar cycle, plus we did several classroom activities where each crew (student group) had to act out where the Sun, Earth, and Moon were in position relative to one another using models or their bodies as models. These short skits allowed students to act out the motions in front of one another, then critique them if there were any errors–and they had fun acting and moving around. We did similar skits and discussions to understand eclipses and tides. As the students began each topic, I also assigned the reading of online articles by NASA and NOAA for homework to provide more background and information about each topic. All of this inquiry activity ended with two major assessments. First the students took a unit test, then they took the Connecticut Mastery Test (CMT) in Science. Their performance on the unit test and their feedback on the CMT (scores come out later) both showed they had a good understanding of the astronomy topics we had studied. We will continue to do more astronomy through the end of the school year, and Ms. Garavel and I plan to make the students even more proficient as amateur astronomers.